KINGMAN – To say Kingman was having another busy weekend is an understatement. More than 70 vendors showing and selling food, arts, crafts, beer, wine and fun made the park their place of business for two days and thousands of folks from the county, state and then some made an appearance to enjoy the fun. Business was good, if not great, for just about all involved, including Wild West Woodcraft proprietor Chandra West. 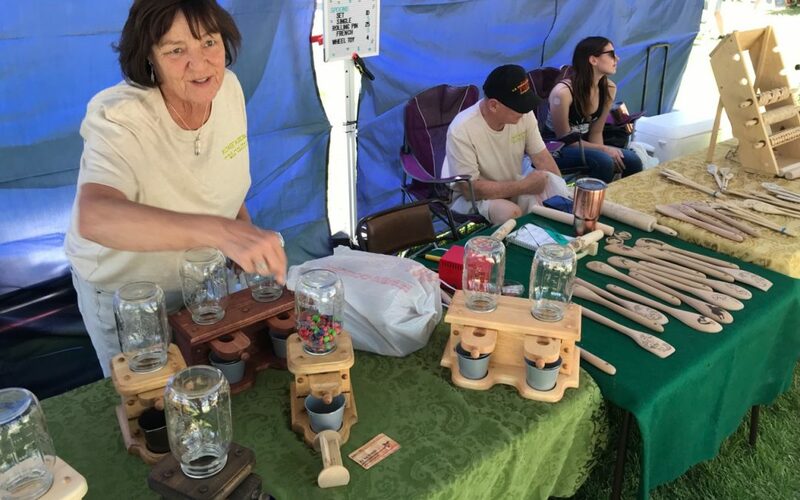 “The response has been overwhelming,” she said, while juggling inquiries about her hand-made candy dispensers and on-the-spot customized wood burning images on anything from spatulas to dough rollers. West has a full-time job. The woodcraft idea started in November 2017 and took off quickly. With the help of her husband, Walt, she hands off a shopping list of craft parts and their extracurricular labor has led to a full-time hobby. “It’s grown to the point where we can’t keep up,” she said. Local adult beverage providers Black Bridge Brewery and Diana’s Wine Cellar poured the beverages as music kept the crowd happy. Lake Havasu City-based Reds Breads sold all things pumpkin. Owner Dawn Sayre also had a hard time keeping up with demand. Metcalfe Park hosts a perfect balance of grass, shade and a stage for music and performing arts, which Kingman Center for the Performing Arts uses to tease their latest talent. Visitors might have to take an extra trip around the block to scout for parking in downtown Kingman during events like these, but it shows that things are picking up. Parking isn’t bad, it’s the walk that makes the trip worth while. No official number is available from host/organizer Kingman Route 66 Rotary Club, but thousands of people from throughout the county, state, other states and who knows how many tourists trekked through Metcalfe Park during the Kingman Festival for the Arts between Saturday and Sunday. “This is a huge turnout,” said club President Susan Williams, who was also a belly dancer with one of the many performing arts groups this weekend. Williams and other Rotary volunteers were helping helm the weekend charade. The next big fun-fiasco is Andy Devine Days Festival that includes a parade, street fair and rodeo in September. For more info on what’s going on around the county, check out www.thebee.news.